The measurement of pitch marks (PMs) is an important part of voice assessment. In diplophonic voice (i.e., a pathologic voice with two pitches) PM determination is crucial, and its validity needs special attention. Hence, a new approach for PM determination from Laryngeal High-Speed Videos (LHSVs), rather than from audio signals is proposed. In this novel approach, double PMs instead of traditional single PMs are extracted from a diplophonic voice sample, in order to account for double fundamental frequencies. The dominant oscillation frequencies of the vocal folds are extracted by spectral analysis of LHSVs with respect to time. Unit pulse trains with these frequencies are created as PM trains and compensated for the phase shift. The PMs are compared to Praat's single audio PMs. It is shown that double PMs are needed in order to analyze diplophonic voice, because traditional single PMs do not explain its double-source characteristic. The figure shows the audio signal from diplophonic phonation (blue line) together with its estimated PMs (black stems). The circle head stems show the PMs extracted with Praat, which is a standard method. Praat loses sync to the audio signal from 0.185 s to 0.23 s. The PMs obtained with our approach (cross head stems) show consistent patterns at all times. There is no established ground truth for double pitch mark analysis of diplophonic voice, which is herewith originally proposed. 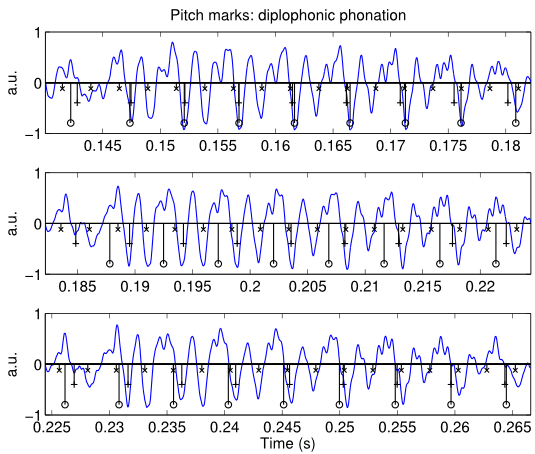 The paper “Double Pitch Marks in Diplophonic Voice” is presented at the IEEE International Conference on Acoustics, Speech and Signal Processing 2013.